The humerus (upper arm bone) runs from your elbow to your shoulder and meets at the rotator cuff with a ball-like end known as the greater tubercle. This is the 'ball' part of the ball and socket joint in your shoulder. The scapula (shoulder blade) is a triangular shaped bone with 2 bony projections at the top, right at your shoulder cuff. One of these projections is referred to as the acromion and it sits above the humerus. 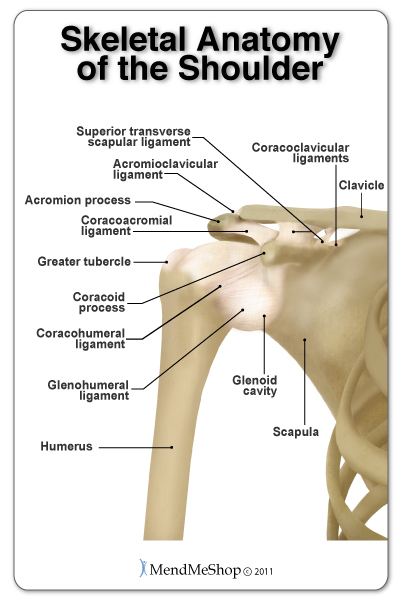 The other is called the coracoid process and it sits in front of the acromion and below the clavicle. Where your humerus meets your scapula there is a very shallow concave 'socket' known as the glenoid cavity (also called the glenoid fossa).